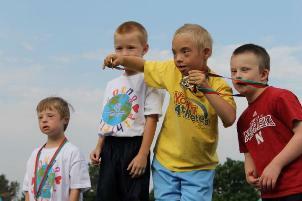 Special Olympics Nebraska is excited to involve our youngest athletes in the fun of Summer Games! Two of our favorite Young Athlete traditions is Athlete Parade at Opening Ceremonies (led by Young Athletes) and the 50m Exhibition Race at State Track! Any athlete who is involved in Young Athletes is invited to attend both events. We are asking families to pre-register for both events so we can have an idea of how many will be attending. Any question regarding these events can be addressed to Youth and Schools Program Manager Taylor Johnson at tjohnson@sone.org. Young Athletes Parade at Opening Ceremonies! The Athlete March at Opening Ceremonies is a chance for each delegation to shine in front of crowds of fans at the Creighton University Sokol Arena. Leading this parade of athletes are our youngest stars, the Young Athletes! Young Athletes should meet in the Ryan Center adjacent to the Sokol Arena at 6:00pm where the Young Athletes will receive t-shirts and be lined up with a parent or family member. Taylor Johnson will distribute Opening Ceremonies tickets to the Young Athlete and family members in the staging area. One parent or family member is allowed to walk-in the parade with their athlete if necessary. After the parade, we will have designated seating in the arena for the Young Athletes and their families to enjoy Opening Ceremonies. Please RSVP for Opening Ceremonies by May 4, 2016. Young Athletes 50m Race at Summer Games State Track! Our littlest athletes are invited to show off their sprinting/walking/crawling skills at our 50m exhibition race at our Summer Games state track meet at Omaha Northwest High School on May 21st. The race begins at 8:30am and all racers should be on the track by 8:00am for lining up. Please RSVP for the race by May 4, 2016.